"Sir, we've got a shootout under the ice." Lionsgate & Summit have debuted the action-packed first official trailer for a movie titled Hunter Killer, a modern day submarine thriller about an American submarine captain who has to rescue another American sub in distress. Gerard Butler stars as Captain Joe Glass, and the movie's full cast includes Gary Oldman, Common, Linda Cardellini, Caroline Goodall, Michael Nyqvist, Ryan McPartlin, and Toby Stephens. The main plot involves the captain discovering a secret Russian coup, making this the most important mission of his life in order to maintain world order. I've been curious to see some footage from this, and it doesn't look so bad. There's some heavy CGI action in this, and it doesn't all take place on the sub, so I'm not sure. The new poster is awesome, even better than the trailer. Deep under the Arctic Ocean, American submarine Captain Joe Glass (Gerard Butler) is on the hunt for a U.S. sub in distress when he discovers a secret Russian coup is in the offing, threatening to dismantle the world order. With crew and country on the line, Captain Glass must now assemble an elite group of Navy SEALs to rescue the kidnapped Russian president and sneak through enemy waters to stop WWIII. Hunter Killer is directed by South African filmmaker Donovan Marsh, director of the films Dollar$ + White Pipes, Spud, Spud 2: The Madness Continues, and Avenged previously. The screenplay is written by Jamie Moss and Arne Schmidt, based on the novel by Don Keith & George Wallace. 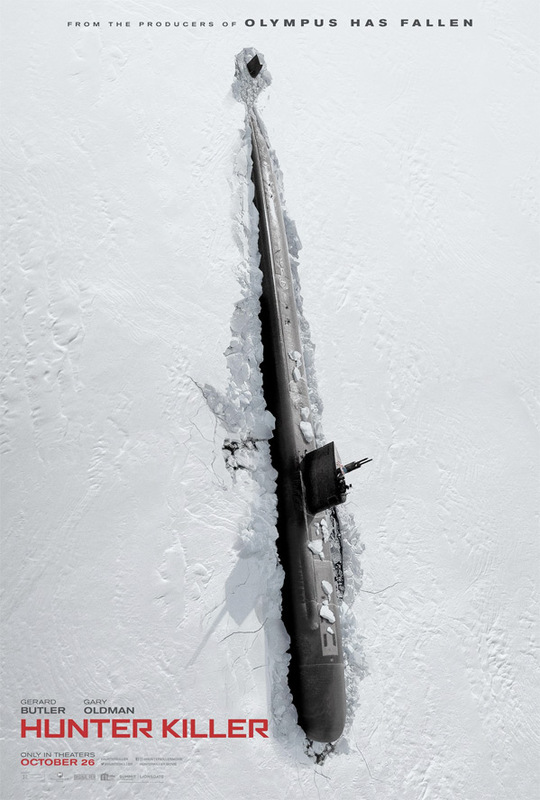 Lionsgate/Summit will release Marsh's Hunter Killer in theaters everywhere starting October 26th this fall. First impression? Who's in?